Find a Flamenco Dancer for hire near you in minutes! Option 1. Enter your event location below & contact a Flamenco Dancer directly! Option 2. Request multiple quotes from available Flamenco Dancers Get Quotes! Option 3. 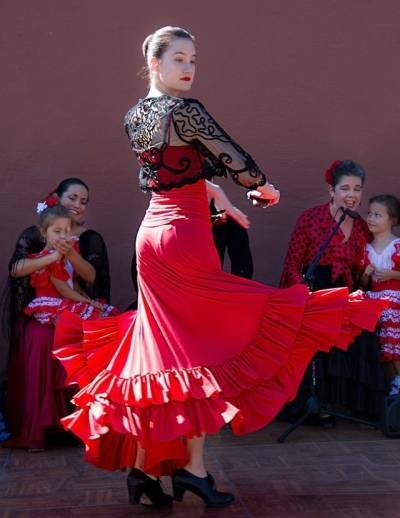 Read information & advice on hiring Flamenco Dancers Read Advice! WANT TO KNOW MORE ABOUT FLAMENCO DANCERS? Read on for the most comprehensive guide to booking Flamenco Dancers, including how much a Flamenco Dancer costs, exactly what they will do at your event, plus tips, advice and information to help make your event one to remember! With a Flamenco Dancer, you will get a professionally trained dancer that will spice up your event with sensual and breath-taking Spanish dancing! What exactly will a Flamenco Dancer do at your event? A Flamenco Dancer will burst into your event and shake things up with a passionate dance that will incorporate all the traditional brilliance you would expect to find in a Flamenco Dance, including handclaps, finger snapping, some vocals and of course, the wonderful, sensual dancing! Hire a Flamenco Act and you may get a Flamenco Dancer as a solo Flamenco performer, dancing to traditional Spanish backing tracks, or you may get a Spanish Dancer accompanied by a live Spanish guitar player. You may also get more than one Flamenco Dancer (if you can handle such a thing!) If the profiles on our site do not state what form of Flamenco act to expect, then please feel free to use our personal messaging service to enquire! Mainly, a Flamenco Dancer will entertain your audience with a fantastic live show that will put the wow factor into celebrations and impress your guests, whatever their entertainment tastes may be. What event types are Flamenco Dancers hired for? Once the wedding nuptials have been said and the wedding register has been signed, then you may want hire a Flamenco Dancer to dance with a live guitarist and backing track as the wedding entertainment at your wedding drinks reception! The Flamenco Dancer will really bring a joyous energy to add to the great atmosphere as the bride and groom chat to family and friends alike. If you’re trying to think of a unique and special way to ensure your wedding breakfast is a personal and fun experience, then hire a Flamenco Dancer to thrill your guests as the cake is being cut by the bride and groom. What a fantastic way to help remember such as special moment, especially if you are hosting a Spanish themed wedding! With fancy footwork, explosive dance moves and dazzling tradtitional Spanish dress-wear, you and your wedding guests will be blown away by the Flamenco Dancing on display at your wedding evening reception! These professional Flamenco Dancers will know how to use drama, comic interludes and crowd participation to get everybody excited at your wedding reception! The Flamenco Dancer can be set up as the evening receptions main form of entertainment on your stage or, even better, on ground level with your wedding guests! Maybe you want to hire a Flamenco Dancer for your corporate event? The Flamenco Dancer, or Flamenco Dancers, can be a great ice-breaker at your work event. Whether it’s a colleague’s leaving do, a Christmas party or the end of the financial year party, Flamenco Dancing will certainly get your guests talking and who knows, it may even get them joining in on the Spanish tradition themselves! Have you ever considered hiring a Flamenco Dancer for your trade event or your product launch? A live Flamenco Dancer will bring the passion to your event and will captivate your crowd/potential clients, making your product enticing and exciting! A Flamenco Dancer would also be great to hire as cruise ship entertainment or holiday camp entertainment! Bringing class and a certain sassiness with them where ever they go! Hire Flamenco Dancers and you will get both male and female Flamenco Dancers who will shine at your party! Seeing male and female Flamenco dancers is a fantastic site and will warm up the coldest of venues! As mentioned, the Flamenco Dancers will either come with a live Spanish guitarist, or they will use backing tracks. Either way, the music played (or Cante, as it is known in Flamenco terms!) will be traditional Spanish music that will include Spanish, nylon stringed guitars, fast paced rhythms and sensual bass lines! Perfect for a Spanish themed party! As well as hiring Flamenco Dancers for your Spanish Party, there are so many other Spanish ideas you can incorporate for your guests, such as traditional Spanish clothing styles and Spanish food! Part of Flamenco is ensuring that the guests feel involved in the dramatic dance, so the Flamenco Dancer will know how to get everybody clapping and clicking along! If you are looking for entertainment for your hen-do party, then why not hire a Flamenco Dancer to give you Flamenco dancing lessons?! This will be a fun and healthy way to celebrate your hen-do night! We advise to use our personal messaging service to enquire if the Flamenco Dancers offer services such as lessons. How much do Flamenco Dancers cost to hire? Our simple to use entertainment directory allows you to firstly search for the best Flamenco Dancers who are local (or travel to your area) and then via the contact form you may message them directly to enquire for a no obligation quote to perform at your event. Some acts will also add a rough price guide to their profile for your convenience. What are the usual set formats and performance lengths for Flamenco Dancers? A Flamenco Dancer can tailor their performance to times to suit you and your event, however, on average a professional Flamenco Dancer will perform for 60 minutes. How much space will Flamenco Dancers need at your event? This will depend on how many Flamenco Dancers you hire. We would advise to contact the Flamenco Dancer personally using our messaging service to enquire. What equipment and set up requirements do Flamenco Dancers need? As with most artists who sign up to Entertainersworldwide.com, a Flamenco Dancer will provide all of their own equipment. You may want to enquire if an artist needs a PA to amplify their sound, in which case we would advise to use our easy to use messaging service to find out. We do ask that each performer gets a backstage area in which they can prepare for the performance ahead. If your venue does not have a backstage area, then we kindly ask that you enquire with the venue to seek an alternative space in which the performer can comfortably get ready to entertain. How can you find and book a Flamenco Dancer with Entertainersworldwide.com? WANT TO RECEIVE A RANGE OF QUOTES FROM Flamenco Dancers?